In 2018, the Queensland Government introduced interest-free solar grants for eligible homeowners**. These loans were valued up to $4,500 with a repayment period of 7 years. Gold Coast Energy is an eligible solar supplier for this loan as we are a Clean Energy Council Solar Retailer. We are more than happy to help you through the solar process every step of the way. These solar grants will only be available until funding is exhausted OR on June 30, 2019 so contact us for a quote which you will need when applying for the interest-free loan. 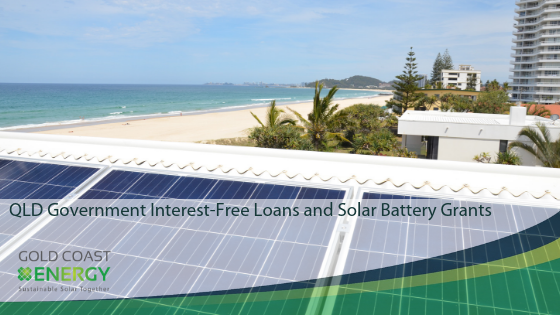 Alongside this interest-free loan, the Queensland Government will also be offering 500 solar grants valued up to $3,000 for homeowners** interested in purchasing a solar battery for their solar system. The Government will also offer loans of up to $6,000 which will be repayable within 10 years. Homeowners will be able to apply for both to help fund an eligible battery system. Businesses, trusts and body corporates will only be able to apply for a solar battery grant. If you are a homeowner receiving the 44c feed-in tariff under the Solar Bonus Scheme you also won’t be eligible. There is a final option being offered by the Queensland Government which is 1000 assistance packages. These include an interest-free loan and solar grant for a combined solar and battery system. Homeowners are offered a solar battery grant of $3,000 as well as interest-free loans of up to $10,000. This is to be repaid within 10 years. Homeowners are eligible to apply for both with businesses, trusts and body corporates only eligible for the grant. 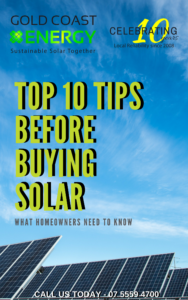 Additional eligibility clauses apply for this option such as not having an existing solar system installed on your property, and that you aren’t financing the proposed system through a solar power purchase agreement OR solar lease. This incentive by the Queensland Government is a big helping hand to families who may not be able to consider investing in solar due to financial hardships. Imagine being able to contribute positively to the environment without having to worry about the stress of where the money will come from to invest. Another positive for many homeowners is that only solar suppliers signed on to the Clean Energy Council Solar Retailer Code of Conduct are eligible to supply you with your solar system. This means you deal with companies you can trust, with a wealth of knowledge and experience. Gold Coast Energy is one of those companies. With 10 years of experience, we are committed to providing you and your home with a high-quality solar system, battery or combination of the two that will meet your energy needs. We don’t compromise on quality, but ensure you get a system you can rely on, without blowing out your budget. We recommend you choose us as your solar provider when applying for any of the incentive options. For more information, contact us, and we will be happy to keep you informed when the Government releases more information regarding the solar battery grants. **Please note that there are strict eligibility requirements for applicants. Find out the eligibility criteria by clicking here. More information regarding this Government incentive can be found on their official website, or here.